Efficiency and cost effectiveness within multimedia delivery is fast becoming a hot topic in wireless communications, with mobile operators competing to offer inexpensive, reliable services. The selection of an appropriate technology and matching it with the offered mix of services will be essential to achieve the market success. 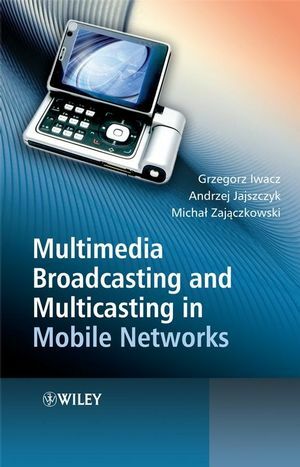 Multimedia Broadcasting and Multicasting in Mobile Networks discusses multimedia services, introducing the potentials and limitations of the multicasting and broadcasting technologies. The authors address the key points related to the deployment of the technology including digital rights management issues, particularly important in terms of the large, business scale deployment of multimedia services and business models. The book discusses the early trials and deployment of Internet Protocol Datacasting (IPDC) and Multimedia Broadcast/Multicast Service (MBMS) and offers an introduction to multicasting in wireless cellular networks. This book provides mobile operators, graduate engineers, network designers and strategists in mobile engineering with a thorough understanding of mobile multimedia and its impact on the telecommunications industry. Undergraduate and postgraduate students studying telecommunications will also find this book of interest. Grzegorz Iwacz works in the Internet industry. His major interest is the development of web applications. He received his MS degree from AGH University of Science and Technology, Krakow, Poland (Major: Telecommunications Networks and Services) in 2006 . He also received a Bachelor's degree from Jagiellonian University, Krakow, Poland (major: Human-computer Interaction) in 2008. He was a student at Helsinki University of Technology, Espoo, Finland in 2005 and was in touch with practical aspects of multicast, especially IPDC technology implementations, while visiting Finland in 2005 and 2006. He has a high level of interest in efficient multimedia delivery in mobile networks and has followed the IPDC technology since its early stages. Andrzej Jajszczyk is a professor at AGH University of Science and Technology in Krakow, Poland.He received his MS, PhD, and Dr Hab. degrees from Poznan University of Technology in 1974, 1979and 1986, respectively. He spent several years at universities in Australia and Canada. he is the author or co-author of six books and over 230 papers, as well as 19 patents in the areas of telecommunications switching, high-speed networking and network management. He has been a consultant to industry, telecommunications operators and government agencies. He was the Editor-in-chief of IEEE Communications Magazine and also serves on the editorial boards of various reputed journals, including Annales des Telecommunications, china Communications and Computer Communications. Over many years he has been active in the IEEE Communications Society, where he is currently its Vice-President. He is a member of the Association of Polish Electrical Engineers and a Fellow of the IEEE. Michal Zajaczkowski is an OSS Solution Manager in the Telecommunications Business Unit at Comarch SA. He received his MS degree from AGH University of Science and technology Krakow, Poland (Major: Telecommunications Networks and Services) in 2006. In 2005, while studying at Helsinki University of Technology, he had his first contact with the practical aspects of multicast. This was then followed by a thorough study on the subject of multicast. This was then followed by a thorough study on the subject of multicast-based technologies, such as IPDC and MBMS, from their very early standardization stages. The study was accompanied by subsequent visits to Finland, scheduled to meet with mobile operators as well as with research and standardization bodies. 2.2 Justifying the cost of multicast. 4. Multimedia Broadcast/Multicast Service (MBMS). 5.2 Digital Multimedia Broadcasting (DMB). 5.3 Terrestrial Integrated Services Digital Broadcasting (ISDB-T). 6. Digital Right Management (DRM). 6.2 Windows Media DRM 10. 6.4 Secure Real-time Transport Protocol. 6.7 Limitations of DRM systems. 7.2 Components specific for IPDC. 7.3 Components specific for MBMS. 7.4 Terminals and networking infrastructure. 7.6 Spectrum for mobile TV. 9.7 Mobile TV ad interactivity.